My black garlic love affair continues in this simple but very refine dish which will turn your everyday meal into a real, healthy and delicious feast. 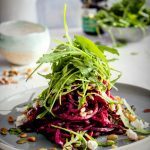 Using only a few ingredients you can get a multilayer, compex effect where sweet and earthy beets meet peppery rocket, and creaminess of goat cheese is contrasted with crunchy nuts and seeds. And above all of this you have a deep, smoky, sweet and undefined notes of black garlic. So yummy. To get this spaghetti looking beets you need to use spiraliser. If you don't have this smart tool just cut the beets finely in julienne (thin stripes). You can serve them in a bowl or on a plate like a warm salad. On a dry pan toast your nuts and seeds mix until golden. Transfer them to a bowl and set aside. 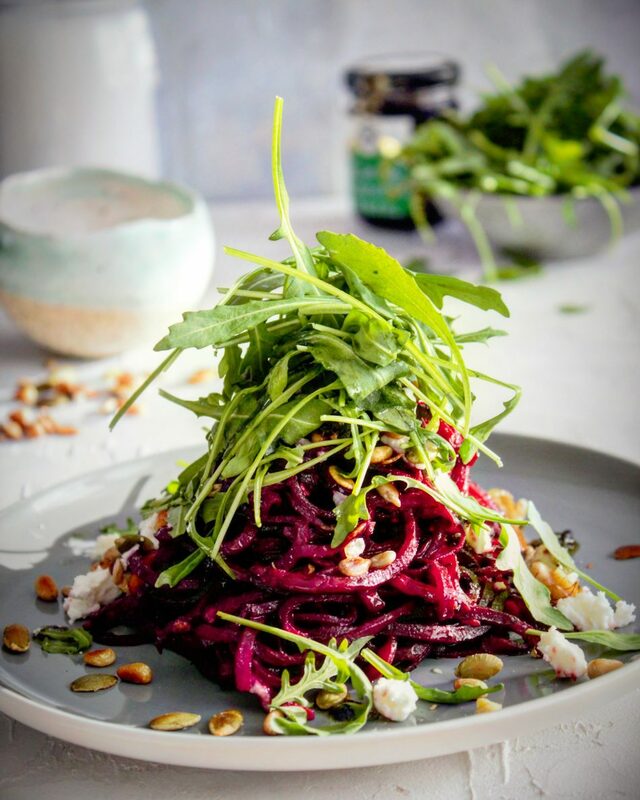 Using spiraliser cut your beets in long, spaghetti looking, zoodles. Cut them in few places to make them more convenient to eat. Once again heat the pan with a little amount of water. Add a pinch of salt and a small splash of olive oil. Add beetroots and cook them for a few minutes until soften. Do not overcook them- they should stay a little bit hard inside (al dente). Mix pesto, black garlic paste and a small splash od olive oil (if necessary) in a big bowl. Using kitchen tongs tranfer beets to the bowl and mix everything until beets are covered with the sauce. Season with salt and freshly ground blackpepper. Stack the beet zoodles on a plate. Crumble some goat cheese on top, and sprinkle generously with seeds & nuts mix. Finish with some fresh rocket. If you need a shortcut you can use a basil or rocket pesto from a jar, but I highly recommend to make your own, very easy, rocket pesto. It is delicious, you can store it for weeks, and it is a great way of using rocket which is not super fresh anymore. Place rocket, sunflower seeds, garlic and parmesan in a blender and mix everything into a paste. At the end of mixing start slowly adding olive oil until your pesto is nice and well combined. Do not blend it too long- you should still feel a small pieces of seeds on your tongue. Season with salt, black pepper and a touch of lemon juice. Store in a fridge in a closed jar. Put an extra amount of olive oil to cover the pesto completely.